North Korea's leader Kim Jong Un watches a military drill marking the 85th anniversary of the establishment of the Korean People's Army in this handout photo by North Korea's Korean Central News Agency made available on April 26, 2017. MANILA, Philippines — China delivered frank advice to North Korea, its outcast neighbor, on Sunday, telling Pyongyang to make a “smart decision” and stop conducting missile launches and nuclear tests. The statement by Chinese Foreign Minister Wang Yi came on the heels of a U.N. Security Council decision to impose additional sanctions on North Korea and its exports, and suggested that the American push to further isolate the regime of Kim Jung Un is reaping some dividends. But Wang also called on the United States to dial back the tension. After meeting with North Korea’s top diplomat during an Association of Southeast Asian Nations, or ASEAN, gathering here in the Philippine capital, Wang said that the situation on the Korean Peninsula is critical — but that it could be a turning point for negotiations over North Korea’s nuclear proliferation. Secretary of State Rex Tillerson arrived in Manila on Saturday night in what State Department officials have said will be a concerted effort to enlist other countries in the campaign to get North Korea to abandon its missile and nuclear tests. Concern has mounted that North Korea is developing its missile technology more quickly than expected, after tests last month of missiles that experts said are capable of striking the U.S. mainland, perhaps as far inland as Chicago. “Certainly we want to resolve this issue through negotiations, and this pressure campaign, the sanctions, it’s all about trying to convince the North Koreans that the fast way forward is to come back to the table and talk,” said Susan Thornton, assistant secretary for East Asian and Pacific affairs. But Tillerson also has pointedly stated several times that the United States does not seek regime change or a rapid reunification of the two Koreas, which have been in a state of suspended hostility since an armistice was declared in 1953. On Sunday, he declared the latest U.N. sanctions a “good outcome.” That prompted South Korean Foreign Minister Kang Kyung-wha to correct him slightly. “It was a very, very good outcome,” she said. South Korean officials told reporters after the meeting that Kang and Tillerson had agreed to pursue the denuclearization of the Korean Peninsula through peaceful measures. But the diplomatic road ahead is rocky. 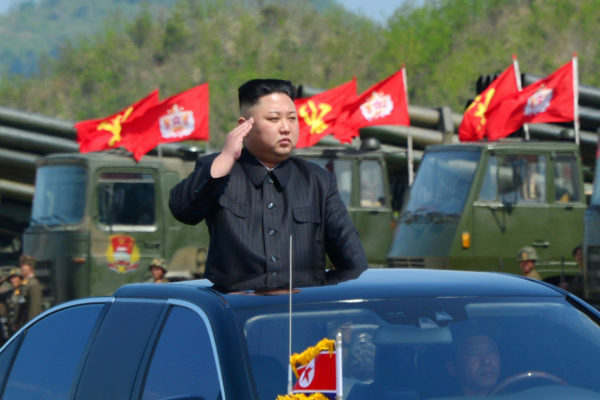 U.S. officials rejected Beijing’s call for the North to halt its nuclear program in exchange for the United States and South Korea suspending joint military exercises, which Pyongyang considers a prelude to an invasion and regime change. “This kind of moral equivalency that’s implied by the freeze for freeze, which is between the North Koreans shooting off missiles that are prohibited and our reasonably defensive exercises that we undertake in our alliance with the South Koreans to protect them from these launches, is not a reasonable kind of a trade,” Thornton said. Thornton also said the United States would be “watchful” to ensure that China did not slip from its adherence to the new sanctions, which she characterized as the strongest in a generation. The United States has unsuccessfully lobbied for the 27 members of the ASEAN Regional Forum to suspend North Korea’s membership. The response has been polite but noncommittal. U.S. officials have been adamant there will be no direct meetings with North Koreans in Manila, even among lower-level officials. Tillerson met for about an hour with Russian Foreign Minister Sergei Lavrov. They smiled amiably and made small talk but ignored a reporter’s question about how the fresh U.S. sanctions against Russia that Trump signed last week would affect their talks. Lavrov told reporters that he believed the United States would continue a dialogue with Russia despite what both sides have described as the worst tensions since the Cold War ended. The ASEAN conference also addressed other issues of regional concern. Delegates are working to establish the framework for a code of conduct in the South China Sea that would reaffirm respect for the freedom of navigation and overflight, and outline how to arbitrate disputes. The demands that China stop expanding and reinforcing man-made islands in the sea, however, have been watered down from a year ago as more pressing demands have risen to the forefront. The United States is particularly concerned about Islamist militants gaining a foothold in the Philippines, after being pushed out of Syria and Iraq. In the city of Marawi in the country’s south, Philippine forces are fighting militants who claim to be affiliated with the Islamic State. Tillerson started the day on a somber note when he visited the Manila American Cemetery and Memorial, where 17,000 American and Philippine troops who fought in the Pacific during World War II are buried.